It’s a difficult and costly thing, trying to live up to the expectations of others: difficult, because those expectations are often unspoken and impossibly high; costly, because trying it draws us toward living someone else’s life at the expense of our own, which in the end leads to a kind of death. My father taught me that lesson well. What I learned best from him was how to be obedient, to be the person he needed me to be. It was only after he died and I began life as an adult that I started learning how to be the person God was creating me to be. The tension between those two impulses, between trying to be the person others would make of me and being the person God is making of me, has been one of my father’s lasting legacies. It has been a burden I always carry with me. It is also been one of his greatest gifts, a lens that helps me see my choices in life as doorways of grace, as recurring opportunities to choose the life God offers. The tension between burden and grace is not only part of my reality. It’s part of the reality all of us inhabit to some degree. We learn early in life that the world has expectations of us. It demands certain behavior as the price of acceptance. It lays down rules and expects us to obey them. That’s not a bad thing. Having rules and obeying them can help us live together in peace. Rules can also be oppressive. They can separate us from life as God would have us live it. God also has expectations of us, we learned at an early age, rules and laws we are to follow as the price of our acceptance. The first one – don’t eat of that tree – was followed by others. Don’t put anything ahead of God your Creator. Don’t make or worship idols. Take one day of complete rest each week. Don’t murder or commit adultery or steal – ten of them in all. By the time it was finished there were 613 of them. “Now therefore, if you obey my voice and keep my covenant, you shall be my treasured possession out of all the peoples” (Exod. 19:5). Obey me, God said, and you will be acceptable. Obey me, or else. A lot of people live and relate to God that way. We in the mainstream church today are well practiced at obeying the command to love God. But how often do we act as if we’re really in love? We can settle easily into the familiar Sunday morning routine and meet the expectations of God and our tradition and forget that we are immersed in something powerfully and inscrutably holy. But there is another way to worship. Martin Luther described faithful worship as a “tenth leper” moment. Worship isn’t the fulfillment of an obligation or the performance of a duty. It’s what someone described as “the return of a grateful heart to the source of its healing.” It’s the unbridled expression of giddy delight in what completes us and gives us back our lives newly minted. When we say “thanks,” when we live immersed in gratitude, when we live like the tenth leper, something happens. First, we begin seeing eternity in every present moment. A grateful heart slowly comes to recognize God in everything, in every creature and experience and manifestation of life. A grateful heart comes to see that we stand in a never-ending flood of grace and peace from God who provides everything necessary for fullness of life. A grateful heart brings us, each moment, into the presence of the holy. The practice of gratitude also gives integrity to our lives and makes us a more complete expression of the Divine. There’s a legend about a storyteller who gives up his fickle life and enters a monastery. When he finds he is unable to live the disciplined and obedient life of the monks, he prays to the Virgin Mary, who tells him to serve God with what he can do, namely to dance. From then on, when the other monks are at prayer, he dances. Finally, he’s called to the abbot and believes he’s about to be expelled. But the abbot says, “With your dancing you have glorified God with body and soul. But may God forgive us all the lofty words that pass our lips without coming from the heart.” Gratitude moves us from constrained obedience to uncontainable love. 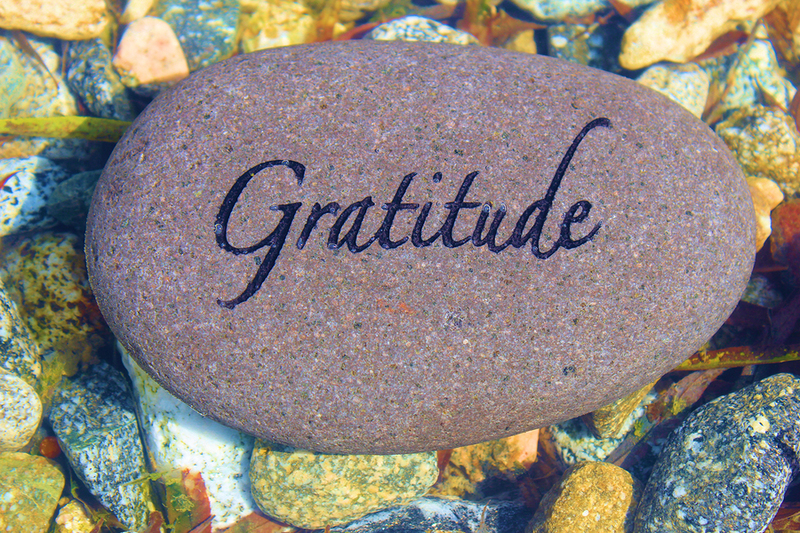 Gratitude can be a powerfully transforming practice. Psychologists Robert Emmons, of the University of California, Davis, and Michael McCullough, of the University of Miami, have found that practicing gratitude can improve our emotional and physical well-being. Their Research Project on Gratitude and Thankfulness has found that people who keep weekly gratitude journals had fewer physical symptoms, exercised more, had a better outlook on life, and were more likely to reach their goals. People with neuromuscular disease who practiced daily gratitude had more high-energy positive moods, felt more connected to others, and felt more positive about life in comparison to a control group. Do we want a cure for what ails us and the world? Do we want to be made well? We have the obedient routine of church pretty well mastered. Do we know as much about how to love, how to really love? What difference might it make if at the close of every day we were to write down our answers to two questions: What have I received today, for which I am grateful? And what have I given today, for which someone else is grateful? They just might be the wake-up call to new possibilities of a healed life lived leaning into God.